Last week I was talking to Amy Paul from Ruby Hills about her organic lamb deliveries into Melbourne and also saw Ben Falloon, from Taranaki Farm, successfully crowd-funding $111,507 for an micro-abattoir to process his pastured chickens on-farm. It got me thinking about organic and regenerative meat. Lots of people I know eat organic fruit and veg but eat conventional meat because of the big difference in price. Picks up pack. Reads label. Shaken, grabs a pack of shed-raised chicken breasts for $12 a kilo and heads for the checkout. Back in the day (think 50-60 years ago) chicken was really expensive, meat to be eaten only on special occasions, like birthdays and Christmas. These days it’s the cheapest meat around. So rather asking why organic chicken is so expensive, maybe the better question is how did chicken get so cheap? In the late 50’s the guys down at Corporate Chicken thought there was a potential market for a cheap chook. They gathered the best brains in the chicken business to work out how to bring production costs down. The answer was to first breed a chook that grew extremely quickly that was ready to butcher in 32-40 days (chickens are now four times the size they were in the fifties). Next was to put 40,000 of these chooks in a barn and keep the lights on 23 hours a day so all those fast growing chooks would eat and eat and eat. Finally they worked out that feeding the chooks antibiotics not only kept away infections but also promoted even more growth. Combined these ‘advances” brought the cost of chicken production down so low that today a barbecue chicken at Coles and Woolies only sets you back $9. The chickens however weren’t the only ones getting a raw deal. Chicken is also cheaper if production workers are underpaid. In 2015 Baiada Poultry, owners of Lilydale Free Range and Steggles, were found by the Fair Work Ombudsman to be paying its workers as little as $11.50 an hour for shifts as long as 19 hours! Compare this to Ben Falloon’s farm. Ben’s chickens are raised in a paddock in flocks of less than 300. 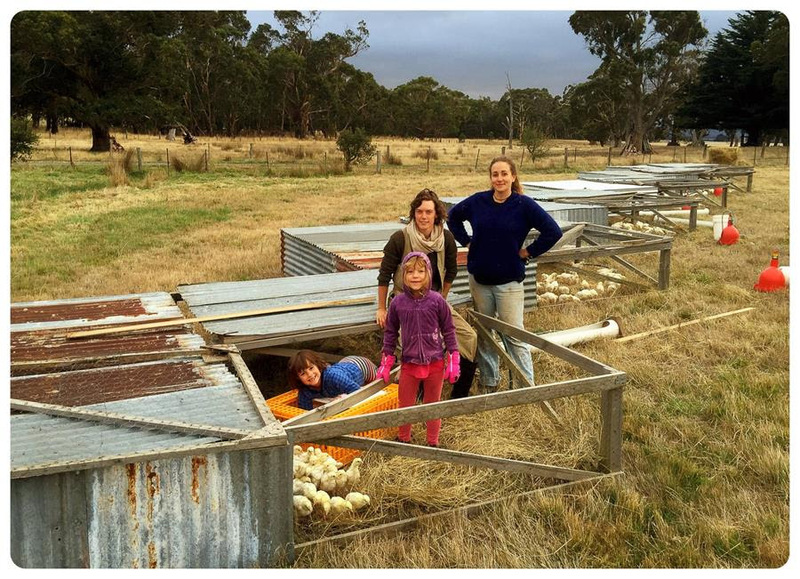 They sleep in mobile chook sheds without lights. Every day the chooks are moved to a fresh patch of pasture where they scratch for insects and eat grain, herbs, forbes, legumes and grasses. Generally it takes around 80 days for an organically raised chicken to reach maturity. Ben’s new on-farm micro-abattoir means he will be able to process his chickens himself without them having to travel to an abattoir away from the farm. Ben’s chickens also serve a purpose beyond commodity; they work in rotations following the sheep and cows playing a key role in pest control and building fertility that helps regenerates the farm. Farming this way means organic chicken compared to factory farmed chicken seems expensive. Only organic chicken hasn’t got any dearer, industrial chicken just got cheap – really cheap. Interestingly regenerative farmers, like Tammi Jonas, from Jonai Farms have a take on the affordability question. Tammi believes, like many in the science community, that we should be eating less meat in our diets. Tammi advocates we put less meat on our plates but the meat that we do eat should be raised in the most ethical and regenerative way possible.